Global dust storms on Mars could soon become more predictable -- which would be a boon for future astronauts there -- if the next one follows a pattern suggested by those in the past. A published prediction, based on this pattern, points to Mars experiencing a global dust storm in the next few months. "Mars will reach the midpoint of its current dust storm season on October 29th of this year. Based on the historical pattern we found, we believe it is very likely that a global dust storm will begin within a few weeks or months of this date," James Shirley, a planetary scientist at NASA's Jet Propulsion Laboratory, Pasadena, California. Local dust storms occur frequently on Mars. 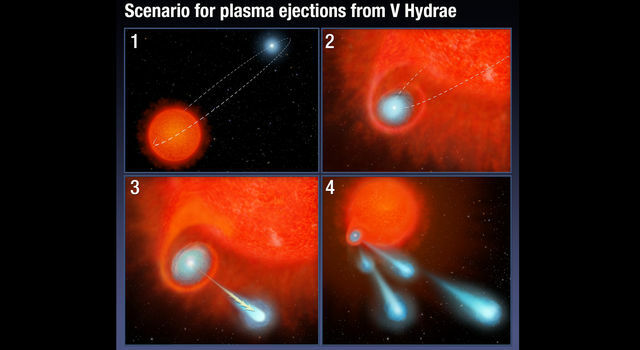 These localized storms occasionally grow or coalesce to form regional systems, particularly during the southern spring and summer, when Mars is closest to the sun. On rare occasions, regional storms produce a dust haze that encircles the planet and obscures surface features beneath. A few of these events may become truly global storms, such as one in 1971 that greeted the first spacecraft to orbit Mars, NASA's Mariner 9. 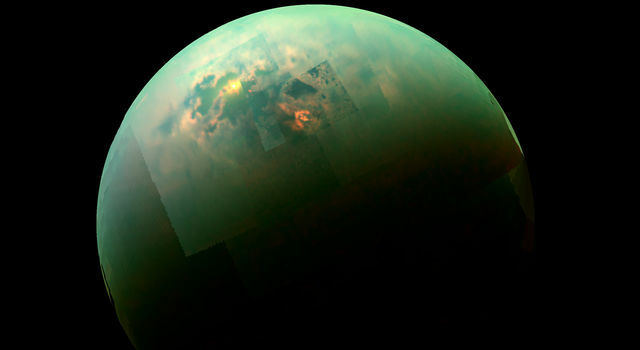 Discerning a predictable pattern for which Martian years will have planet-encircling or global storms has been a challenge. The most recent Martian global dust storm occurred in 2007, significantly diminishing solar power available to two NASA Mars rovers then active halfway around the planet from each other -- Spirit and Opportunity. "The global dust storm in 2007 was the first major threat to the rovers since landing," said JPL's John Callas, project manager for Spirit and Opportunity. "We had to take special measures to enable their survival for several weeks with little sunlight to keep them powered. Each rover powered up only a few minutes each day, enough to warm them up, then shut down to the next day without even communicating with Earth. For many days during the worst of the storm, the rovers were completely on their own." Dust storms also will present challenges for astronauts on the Red Planet. Although the force of the wind on Mars is not as strong as portrayed in an early scene in the movie "The Martian," dust lofted during storms could affect electronics and health, as well as the availability of solar energy. 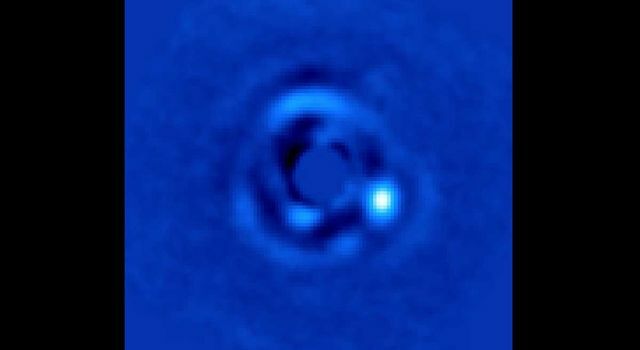 The Red Planet has been observed shrouded by planet-encircling dust nine times since 1924, with the five most recent planetary storms detected in 1977, 1982, 1994, 2001 and 2007. The actual number of such events is no doubt higher. In some of the years when no orbiter was observing Mars up close, Mars was poorly positioned for Earth-based telescopic detection of dust storms during the Martian season when global storms are most likely. 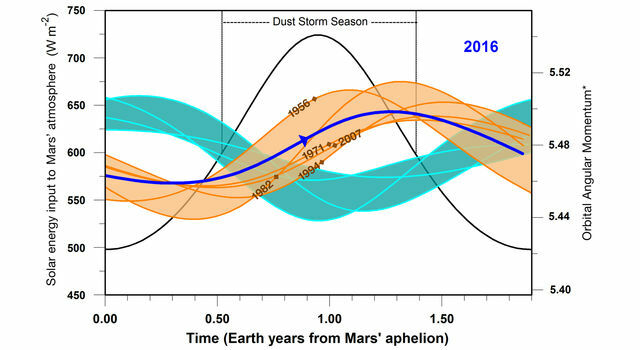 Shirley's 2015 paper in the journal Icarus reported finding a pattern in the occurrence of global dust storms when he factored in a variable linked to the orbital motion of Mars. Other planets have an effect on the momentum of Mars as it orbits the solar system's center of gravity. This effect on momentum varies with a cycle time of about 2.2 years, which is longer than the time it takes Mars to complete each orbit: about 1.9 years. The relationship between these two cycles changes constantly. Shirley found that global dust storms tend to occur when the momentum is increasing during the first part of the dust storm season. None of the global dust storms in the historic record occurred in years when the momentum was decreasing during the first part of the dust storm season. 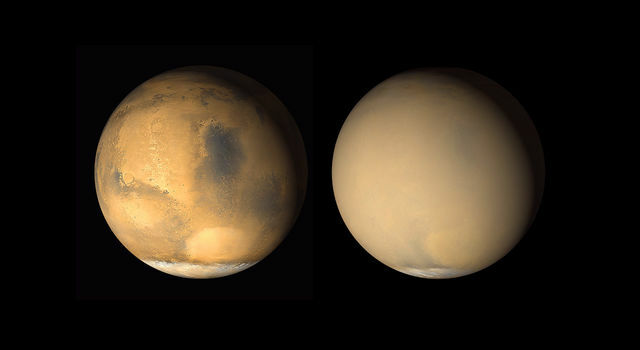 The paper noted that conditions in the current Mars dust-storm season are very similar to those for a number of years when global storms occurred in the past. Observations of the Martian atmosphere over the next few months will test whether the forecast is correct. Researchers at Malin Space Science Systems, in San Diego, post Mars weather reports each week based on observations using the Mars Color Imager camera on NASA's Mars Reconnaissance Orbiter. A series of local southern-hemisphere storms in late August grew into a major regional dust storm in early September, but subsided by mid-month without becoming global. Researchers will be closely watching to see what happens with the next regional storm.